Robert Mugabe, the current President of Zimbabwe, is known to be a dictator wanting to hang on to power at all costs, a person who has brought Zimbabwe to economic ruin. What is the reason behind his seemingly irrational behaviour that is evident in his personality? His hand explains it all too clearly. The aspects of his hand which stand out are wavy Fate and Headlines, short, poor quality Heartline, a branch of which droops down to touch the Headline, either a missing or poor quality Fateline on the mount, a weak Jupiter or Index finger, a short Sunline cut by a deep bar on the mount, a long supple thumb, and a high-set, forked unsteady Headline distinctly apart from the Lifeline. 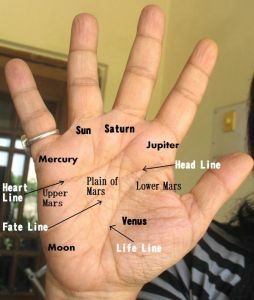 This is the type of hand which can send a chill up one’s spine. Indira Gandhi was called India's Iron Lady by none other than her British counterpart, Margaret Thatcher, who was known as Britain's Iron Lady. The two strong personalities bonded when they met, have been compared and were believed to share some similarities. These two ladies were quite different though, with distinct characters. They were almost as dissimilar as their politics. Margaret Thatcher’s hand shows her to be a bold, arrogant, aggressive, and stubborn woman. Indira Gandhi had a similar image, but oddly enough her hand does not bear it out.